All too many of us have settled into a sedentary lifestyle, even though we know the value of exercise for our physical and emotional health. Excuses abound: I’m too old, I don’t have the energy, it’s too expensive or time consuming, etc. Well, those excuses just went by the wayside, as new research has just confirmed the benefits of a brisk walk, something most of us can do, or at least build up to, with little cost or burden. 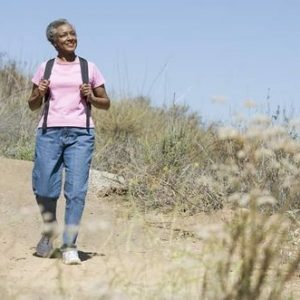 According to a new study in the Journal of Nutrition Health and Aging, women age 60 and older, who are physically de-conditioned, can improve their endurance, and thus health and well being, through a six month brisk walking program. Want to know more? Pull out those walking shoes, and take a look Here. And if you’re looking for some inspiration to get out there and move, look no further than 55-year-old Mimi Anderson, a grandmother who’s also an ultra runner, currently on a mission to break the world record for the fastest woman to cross the US on foot. Read about her amazing journey Here.